Okay, I'm sold. I love those stories in which the love interest start out as "enemies" and then fall in love anyway. I just checked my library's online catalog and they actually have A Matter of Class! It's large print, though, which I'm not crazy about, but since it's relatively short, I think I can handle it. I kept bypassing this book before, but your review has made me change my mind! I'm going to check it out now. Thanks hilcia! I am surpised to hear how short it is. I am glad that didn't effect your enjoyment of the story, though. It sounds like a good read. I'll add it to the list! Leslie, the library is perfect. Definitely an A read for me... couldn't take off points for the price of the Hardcover, lol! Jill D, the length didn't affect my enjoyment because of the way it was developed. It didn't feel incomplete and I was satisfied with it when I finished it. It IS short, and if I have a complaint it's the price of the Hardcover vs. the length of the book. The novella itself is a good one. It sounds good... just too bad it's so short :( Is this a re-issue by the way? Yes, nath it is good AND short. 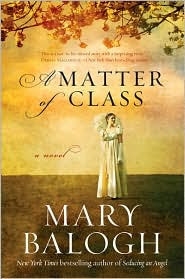 :) A Matter of Class is not a re-issue Nath, it's a new release. Her other two recent releases are re-issues, though. I have to say that I've seen the cover around but hadn't paid any attention to it at all. Bad Tracy. I've only read one Balogh and though I liked it wasn't rushing out to get more. I think I'll have to pick this one up and read it - it sounds great. Thanks for the great review. Hi Hilcia, I'm a first time visitor here. Christine mentioned your review of this book and I had to come see. I agree absolutely, and I'll go so far as to say that this is the best Balogh I've read in years. Years. I did the same thing you did-- I re-read it. Just a gem. Great review, too. I had a hard time writing anything and dancing around the twist. Welcome, Phyl! Thank you for stopping by. It took me a while to write this, I had to stop dancing first too, lol! I agree that this is the best she has written in a long time. It was a wonderful surprise. I loved that the length didn't detract from the beauty of the book.